Today is the fourth anniversary of Dad's death. He died somewhere between 3:30 and 5:30 AM. I think probably closer to the former, given that when I went in to give him his 5:30 morphine, he was neither warm nor especially bendy. Sorry if that's gross, but it's true. I did, as promised, come to the office, because that's what I think he would have wanted. I did not buy myself any jewelry, nor am I planning to cook one of his recipes for dinner. Instead, I did something I think he'd be down with. I bought some ducks. Heifer International, if you haven't heard of it, is a charity that helps people throughout the world by offering them a chance to earn a living with farm animals. They have everything from honey bees to water buffalo, and I think it's a pretty solid thing to do. I've given donations before. I like them, I think they're reputable. Well, a few reasons. When we were kids, Dad learned a joke that he shared with us - it's a written joke, so it's good that this is a blog and not a podcast. The key to this is to read out all capital letters. So, not Mister Ducks, but Em Arr ducks. There's another about puppies where a line reads CMPN? There was also a dirty poem Dad used to recite about ducks. Neither of these is the primary reason I chose ducks, though. I chose them because when Dad was teaching me to drive, he took me to this large cemetery in town. It had a driving path that wound through it. Plenty of four-way stops, left and right turns, and so on. There was a pond in the cemetery with a little bridge that you could drive over. And in the pond, there were a few geese, and lots of ducks. Mostly the domestic Aflac variety - white with a bright orange bill. Some mallards, male and female. But the ones we liked, the ones that made our trips to the cemetery memorable were Muscovy ducks. 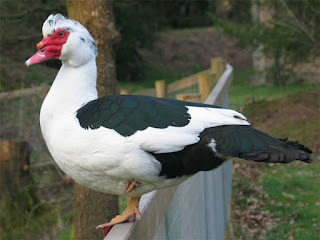 There were a few that hung out in and around the pond, and it's not clear if it was just us that they hated, or if they were angry at people in general, but every time we crossed that bridge, the Muscovies would rush the truck and attempt to attack it/us. Dad usually rolled down his window to quack at them and enjoy the melee. In loving memory of the late, great Guillermo Brejerez, driving instructor, avian enthusiast, father. Such a lovely tribute. The thought of your dad quacking at the ducks made me laugh, which is something I needed today. All the hugs to you.